A PayPal account is not required to pay by PayPal. Upon check-out with our Online Tape ordering process or prior to shipment of your service job, you will receive an email invoice from PayPal and a link to their secure site. If you have a PayPal account and want to use your funds for payment, then log-in to PayPal and complete the transaction. If you do not have a PayPal account, then you can use your credit card securely to complete payment and input your address. Only your address is stored for future use. Once PayPal confirms completion of the transaction, we will process the shipment and send a tracking number and invoice details to you. COD is an available payment option. With UPS, you may assign freight and COD charges to your UPS account - or - request prepayment and addition to your invoice. With FedEx, you may not assign freight and COD charges to your FedEx account. All charges must be prepaid by NPI and added to your invoice. We offer the option of individual PO invoice in line-item detail or single lump sum, weekly consolidated billings and monthly consolidated billings. Consolidate billings show line item detail. 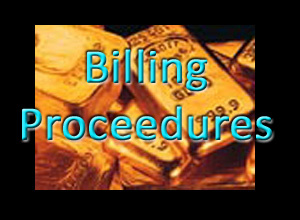 Monthly consolidated billings have an invoice date of the 15th of the month they are billed. All invoices for Terms accounts are electronically transmitted, via email, upload to client's portal or through 3rd party invocie consolidator. Monthly statements are available by email. Delinquent accounts are suspended after sixty (60) days. Payments are accepted at our remitting address, or by ACH electronic transfer.